Look for us in the November 2006 issue of Vermont Sports. The article, 0 to 25 in 5 seconds, Skijoring: The Drag Racing of Cross-Country Skiing, is written by Red Goodman and can be found here. 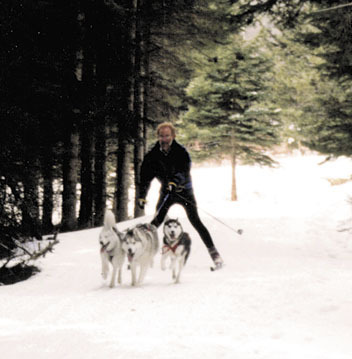 Atii Sled Dogs is featured in the February 2006 edition of the George Lucas Education Foundation online magazine Edutopia, in an article entitled "Powder Play." (Yes, "that" George Lucas, the filmmaker of Star Wars fame. Another "space" and "sled dog" connection.) Read the article online or as a pdf. Please see our Update page for important changes about our dog sled offerings for this summer-fall-winter. This is a private learning experience; we do not give group lessons so that we can give you lots of attention. In the winter: Lessons are 2 hours on snow. In the cooler temperatures of spring, summer and fall, 1- to 2-hour training classes may be arranged for wheeled gig training on dirt trails, as well as command/obedience training. We accept cash, personal checks, traveler’s checks, or money order payable to Atii Sled Dogs. A 50% deposit is required when scheduling your reservation. The balance is due when you meet us for your skijoring lesson. Please send your deposit to: Atii Sled Dogs, P.O. Box 550, Moretown, VT 05660. If you need to cancel your lesson, a refund, less a $25 cancellation fee will be given if written cancellation is received up to 7 days prior to the scheduled lesson. That cancellation fee may be applied for another lesson later this same season if any other opportunities are available due to our booking schedule (and your schedule). If you cancel less than 7 days before your lesson the full deposit will be forfeited if we cannot rebook that time with another client. If Atii Sled Dogs needs to cancel due to trail conditions or any other reason, your full deposit will be refunded. If possible, your booking will be rescheduled for a mutually convenient date during this winter season.